If you're taking this to eat at work, pack up some raw vegetables such as baby plum tomatoes to eat with it. Gently fry the onion and garlic in the olive oil for about 10 minutes, or until soft and golden. Mix in the cumin and fry for a further 4 minutes then tip into a mixing bowl. If using large-leafed, unwashed spinach, wash in 3 changes of cold water, then fold each leaf so that the stem runs down the middle and pull the stalk away from the leaf. Discard the stems and drain the leaves. Drop a third of the spinach into a large pan of boiling unsalted water. Cook for a minute, then fish out with a slotted spoon and drain in a colander. Return the water to the boil and repeat the process until all the spinach is cooked. Once cool, squeeze dry, before patting dry on kitchen paper and chopping roughly. Mix into the sautéed onion with the ricotta and season to taste. Preheat the oven to 200°C/gas mark 6 and lightly oil a baking tray. Open up your filo pastry sheets and keep them covered with a damp tea towel to prevent them from drying out while you work. Take the first pastry sheet and cut in half lengthways, so that you have two long strips, each about 10cm wide. Brush one with olive oil. 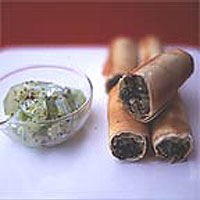 Then place a small sausage-shaped roll of spinach filling about 2cm from one end. Fold the sides over the filling. Brush the folded edges with olive oil before gently rolling up the pastry until you come to the end of the strip. Place on the baking sheet. Repeat the process until the filling is finished. It should make about 14 rolls. Brush each roll with olive oil again, place in the centre of the oven and bake for 20 minutes until crisp and golden. Eat warm or cold.